Portia’s Cloth is a group of handweavers who completed the 2 year certificate course at the Handweavers and Spinners Guild of Victoria in Melbourne, Australia. At the time the Guild met in an old scout hall in Shakespeare St. When we started a weaving group we wanted a name with Shakespearean connections. Eventually we chose Portia’s Cloth. Of course we know that she wasn’t a real person, but we know from ‘The Merchant of Venice’ that she was rich, beautiful and intelligent. The only cloth she would have known would have been handwoven and we aspire to produce cloth of the quality she would have known, but with a more modern twist. I volunteered to start a group blog and when I understand how it works, I hope some other group members will be posting as well. It’s hard to know where to start but a bit about me followed by a tour of the looms and the works in progress seems the obvious choice. After university, I completed a basic weaving course. I loved it but didn’t have the sense to buy a loom. Later, I learned to spin and bought a wheel but the desire to weave was still there. Another short course or two and my first loom, a 4 shaft table loom, followed me home in 1985 when the Guild had a clearing sale as they moved to new premises. Yet another short course and I acquired a 4 shaft direct tie-up floor loom as well. 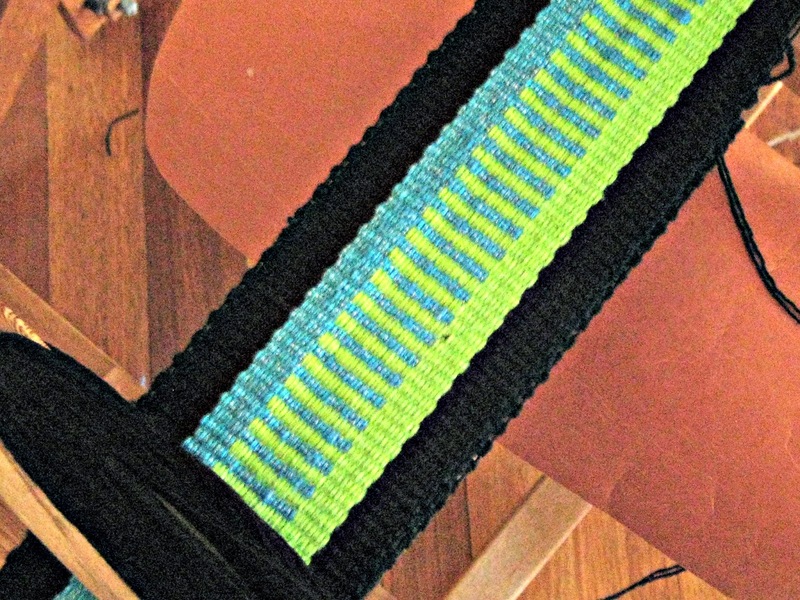 I had started on my weaving journey. In 2005 and 2006 I completed the 2 year certificate course in weaving run by the Guild. Two years of formal training, plenty of weaving practice and documenting it all in a folio was a great experience. It’s given me the confidence to try all sorts of projects and it’s hard to stop. When I’m not weaving I work as an optometrist in my own practice. And now to the looms and works in progress. 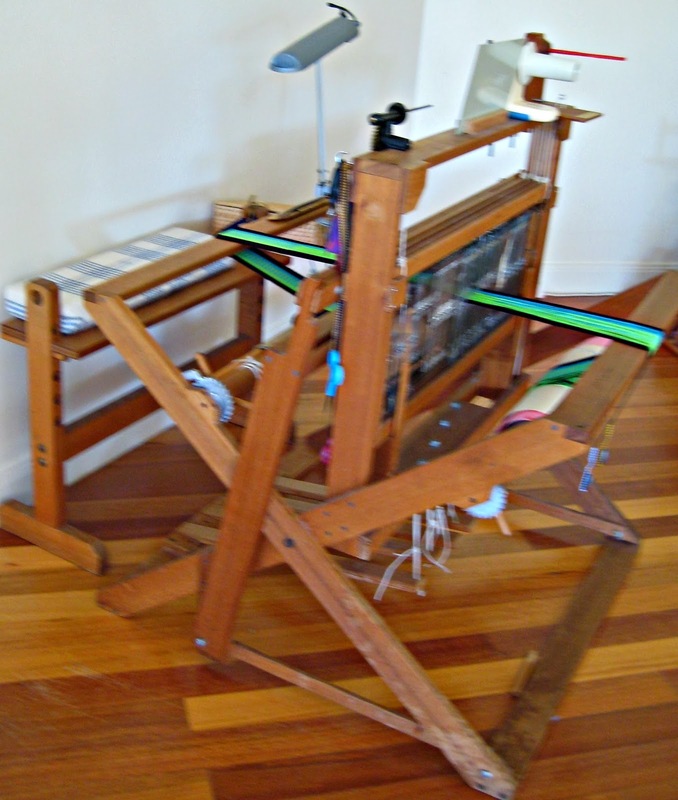 The original 4 shaft direct tie-up loom lives in the house near the TV. It was made by the Druva family who migrated from Latvia and manufactured wheels and looms in Melbourne in the 1970s. I use it mostly for simpler projects like the warp faced band I’m weaving at the moment. This is a 10 metre warp in 3/2 cotton. If it ever ends it will be made into glasses cases which sell well at my practice and the local craft market. 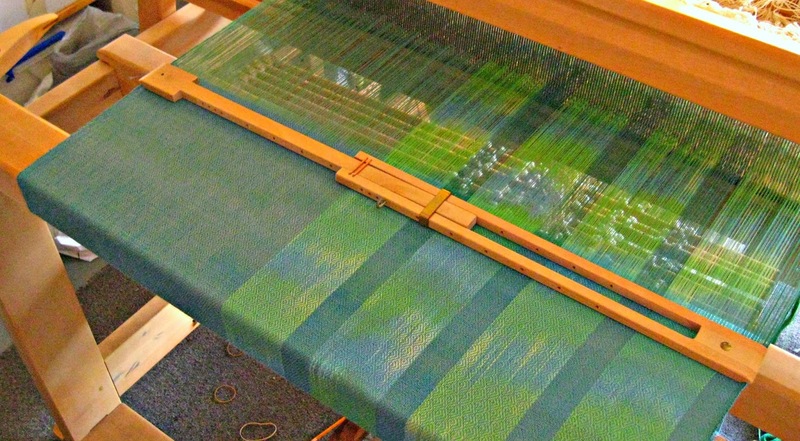 The loom has had a lot of use and had performed well until I made some rag table mats late last year. Weaving these under high tension was probably beyond its capabilities. Cords snapped for no apparent reason, well maybe it was all that tension, and then one of the dowels used to tighten the warp beam, fell out. With hindsight it was probably a bad design but the warp beam is now a bit fragile, hasn’t stopped the weaving, but it will have to be replaced. I’m hoping a friend with woodworking skills and a few Leclerc spare parts will solve the problem. The other loom is an 8 shaft Toika countermarch loom, also from the 1970s; it’s the model that is the forerunner of the Liisa. It’s been modified with something similar to the 20+ tie-up system with the cords secured by golf tees. It lives in half the garage but fortunately our climate is mild enough that I can weave there most of the year. I bought it in 2006 and was told that it had some sort of draw loom capability. I was excited this week when I read an article in VÄV about old shawls from Gotland, and suddenly it all made sense. 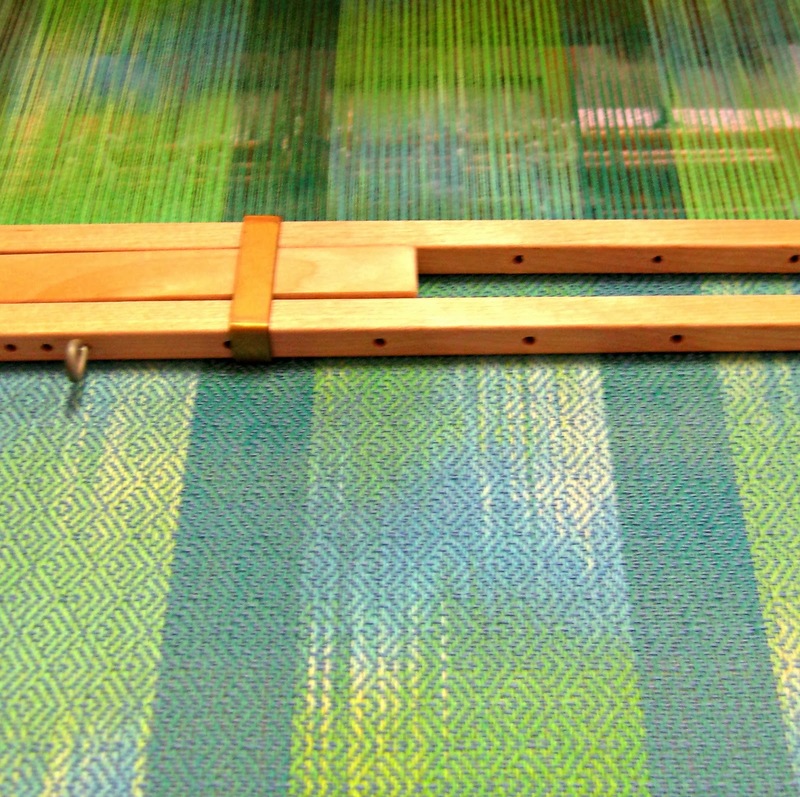 The project used a loom with a 4 unit draw device. This is just the way my loom is set up but whether it actually works might be quite another matter. At the moment I’m about 2 metres into a 6.5 metre painted warp in plaited twill 2/24 wool for yardage (or should that be meterage?) so the exploration of the draw loom will be delayed for a while. I earned my living as a sample hand weaver for the design department of Pendleton Woolen Mills for twelve years until I, and 6 other weavers, were replaced (inadequately) by a computer. Best job I ever had, though weaving hard and fast wore out my shoulders, and a rush demand from one of the designers on a 22 harness crepe weave gave me a herniated disc. So I will be nagging you to do as you ought, and not as I did. Stand up every hour, stretch your back and legs, and flex your wrists and forearms. I assume that your bench is the right height, stable, and lightly padded. I know lots of tricks for fixing broken warp threads and changing warps in mid-swatch. And get one of your wood-worker friends to make you a jig for emergency string heddles. Rather than re-draw and re-tie half the warp because two threads are out of place, just pull them out of the wrong heddles, tie in the string heddles on the right harnesses, rethread and weave like the wind!